A few weeks back I covered a big bridge for cyclists in Nijmegen. It's nice to see such exceptional examples of infrastructure but their importance is often over-stated. The many small bridges which make links in the comprehensive grid of good quality infrastructure in the Netherlands make a bigger difference for cyclists. 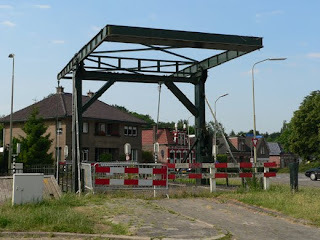 This blog post is about one of those small bridges in Assen. This example is on the bicycle road which takes cyclists from the western side of Assen to the city centre. The bollards at this point are one of several reasons why motorists can't use the road as a through route. As a result, the bicycle road remains almost completely car free, except for people accessing their own homes along the road and this road provides a fantastic direct route for cyclists. Stand for just a few minutes here watching and you'll see all types of people on bikes. The cars rarely move. They belong to people who live along the road and are parked in residential car parking spaces. The historical end of the road is surfaced with old fashioned looking tiles in keeping with the buildings, but they're actually an updated version which give a smoother ride for cyclists. Cycling makes for 41% of all journeys in this city. While it's not the highest cycling rate in the Netherlands, it's a higher rate of cycling than in any city outside the Netherlands. The extremely high subjective safety for cyclists in Assen makes it possible for children to have a much higher rate of independent personal mobility than is the case elsewhere. Look in the opposite direction and it's a similar tale. All sorts of cyclists, many children making their way to the very centre of the city on their own bikes. It's very common for young (and sometimes not so young) couples to travel two to a bike. It's also a good way of collecting children, or to pick up friends from the railway station. Outside the more historical part of the city the bicycle road takes a slightly different form with tarmac for the majority of the surface with a raised and less smooth centre which discourages fast overtaking by drivers. The rules remain the same. Cyclists have priority, and drivers may not park on the road. In effect it is a 5.5 m wide cycle path, and a very pleasant place to cycle. The motor vehicle through route is on the other side of the canal, which is also good for cycling. In total, this bicycle road provides part of a 3.5 km direct line route right into the city centre from the west of Assen. The bridge is not new. Actually, it's an historical bridge in Assen which had pretty much fallen into dis-use. Two years ago it looked as shown in this photo. It was moved a short distance and turned around to take its new place in the city, providing an important link for cyclists. You can tell from the weather that this post was written a few weeks back. The bridge looks a bit different at the moment. This bicycle road has featured several times before on my blog. Apart from the post about the direct route that it creates for cyclists, it was also in a post about how cycling should not be like an extreme sport, showing access to the city centre by bike on a Saturday, and as a demonstration of how cycle routes can be separate from driving routes. Before and after photos of this location can be seen in another blog post. This bridge can also be seen on Streetview. This bridge has been replaced by a much narrower bridge which will cause conflict. This seems to be achieved without ugly double yellow lines or the vast clutter of street signs which choke British roads. In Britain, of course, drivers flout parking restrictions all the time and display selfish complacency when it comes to obstructing facilities set aside for cyclists. Presumably the reason why Dutch drivers don’t act in this selfish way is because most of them also cycle. But to get to that ideal condition, is Dutch parking enforcement stringent and are parking penalties punitive? How did Holland turn it all around? That's a very good question. Yes, parking enforcement is much more stringent than in the UK. People seem to obey the law better, and to object less if they are caught disobeying it (watching the Dutch equivalent of "police, camera, action" is quite amusing. There's lots of hand-shaking and formally introducing each other, and drivers who are caught will generally admit having done the wrong thing). Brit: "Why are there no cars parked on cycle paths ?" Dutch:"Because they'd be in the way." Brit: "But won't people park there anyway ?" Dutch:"No, they'd be in the way. That would be very anti-social." Brit: "But don't they do it anyway ?" Dutch:"No. Anyway, it's against the law"
Brit: "But that doesn't stop drivers in Britain"
Dutch:"Well here the police would stop them"
It of course isn't really true that everyone obeys the law here all the time, and it is true that occasionally a cycle path has a vehicle parked in it. However, there is generally a very good reason - such as delivering some heavy object, and it is a lot less common than in the UK.